A strange haze was hanging over the city of Bangkok when we awoke. It may or may not have rained the night before, and there was an oppressive sticky wetness to the air, which instantly soaked a fellow in his own sweat. I was in a strange place, for recently I had gone to the Citibank to withdraw funds only to find when looking in my wallet that my bank card had evaporated. It seems I had somehow left it in an ATM in the north of Thailand. No harm done though, and Citibank was more than happy to overnight me a new one at no cost to me. Regardless, I felt like an idiot, like Bangkok was making me soft, and was glad to know that the new one had arrived and we were going to wheel to pick it up. This took us down one of the major streets off Rama IV, and we perhaps foolishly decided to pick up the bank card before having breakfast or coffee. So by the time we had arrived at Citibank, soaking with sweat and already reeking from a foul affliction of the armpits, we were a sore sight and in a sour mood. The woman at the front desk was very friendly, despite my dripping reeking saltwater all over her official documents, handing her a sopping wet passport, and repelling most of the other customers to a healthy five-foot radius. With the card back in my possession, I felt good. It also still seemed to manifest cash, which just boosted the already good mood. But as we rode on, the hunger began to hit hard, and the effects of severe under-caffeination began to take hold. We seemed to be trapped in a financial district of Bangkok, and suddenly restaurants were few and far between. The odd street food vendor appeared to be selling either unappetizing things or just sweets, so we wheeled on quickly descending into madness, and frantically searching for a place to eat a real meal. We finally found a joint that promptly overcharged us, but delivered a fair volume of mediocre Thai dishes. The coffee was so thick with sugar syrup, and flavored strangely of black licorice and chicory that I found it completely undrinkable. So it was only in a marginally more lucid state that we took to the road again. Our next waypoint was the train station. We needed to buy tickets for the next day’s train to the border of Laos. We had seen the train station on previous wheels, so we pulled a vast uber-lichtenstein and made our way back to Rama IV. On Rama IV, we were pedaling hard toward the station, keeping an eye out for a source of more decent coffee. I was riding bishop when I heard a terrible noise behind me. I whipped my head around just in time to see Scott sprawled in the street, looking startled and confused. The bright pink cab behind him, thanks be to Jah, had come to a stop well before hitting him. Scott’s Speed TR, on the other hand, had been launched violently into the air, where I witnessed it make solid contact with a passing delivery truck, which pulled the body of the cycle down toward the pavement, eventually sucking the front half through its rear wheel and spitting it back, mangled and bleeding into the street. By this point I had somehow pulled over to the side of the road, and began making my way back toward where Scott was scrambling to collect his sunglasses, his Panama hat, and the twisted remains of his bicycle in order for traffic to resume. He was not lying. The entire front half of Scott’s Speed TR was an ugly wreck. The handlebar post no longer locked into place and curved unsettlingly to the right. His front rack has been bent into what looked like a pile of gray noodles clinging to the wheel. His fork also looked strangely inverted, although the exact damage was hard to describe. We were badly in need of a bike mechanic, and likely not a few spare parts. Now, dear reader, if we might pause from this most recently discussed strife, and think back for a moment to our time in Goa. Scott and I had just unfolded the cycles for our first wheel into the Indian countryside. I had looked down to notice that my primary chain ring had been badly bent during its time in the custody of GoAir. Upon arriving in Bangkok, however, we had brought the cycle to a shop that had been recommended to us by a kind elderly fellow we met at our local coffee joint down the street from Chez Steve. The elderly fellow was from California and dressed in a pressed white shirt, a kind of Irish cap, and a painful set of Burmese spectacles that endured because he was quite fond of the added functionality of their wrap-around ear pieces. He explained to us that these were the standard ear pieces back when he was a young man in the U.S., and back then he could swim the butterfly with his glasses on and no fear of losing them in the water. So when he saw another pair of wrap-arounds while traveling in Burma, he promptly purchased them and had them retrofitted with his prescription lenses. Unfortunately, the frames lacked the little nubs which normally allow the glasses to rest upon one’s nose, so they dug painfully into his face along the crest of his nose, until he had finally resorted to wrapping a length of thread around the offending piece of metal in order to alleviate the slicing into his skin. Our conversation with this man about his glasses turned into a conversation about AsiaWheeling, and eventually I mentioned that I was looking to get my primary ring repaired. He directed us to a bike shop by the name of ProBike, which lay opposite of the central Lumpini Park, where Dane and I had done a fair bit of running during our stay in Bangkok. The fellows at ProBike had first addressed my chain ring with a fair bit of frowning and shaking of heads before repairing the thing in a matter of minutes with a few well places whacks with a mallet, charging me $3.00 and leaving it essentially good as new. Meanwhile, on the side of Rama IV, Scott and I frowned down at his poor speed TR and shook our heads. It was a sorry sight. Scott did not have a scratch on him, but he was plenty rattled. We looked across the street and noticed that we were just on the other side of Lumpini Park. ProBike was perhaps a five-minute wheel away. It seemed the Gods of Wheeling had not yet forsaken us completely, so I climbed onto my cycle while Scott loaded the mangled remains of his Speed TR into a cab and headed for ProBike. When we got there, it took a while for them to perform the full survey. The fellows explained to us in bits and pieces of English that we would need at the very least a new fork and handlebar post, and likely a new wheel as well. 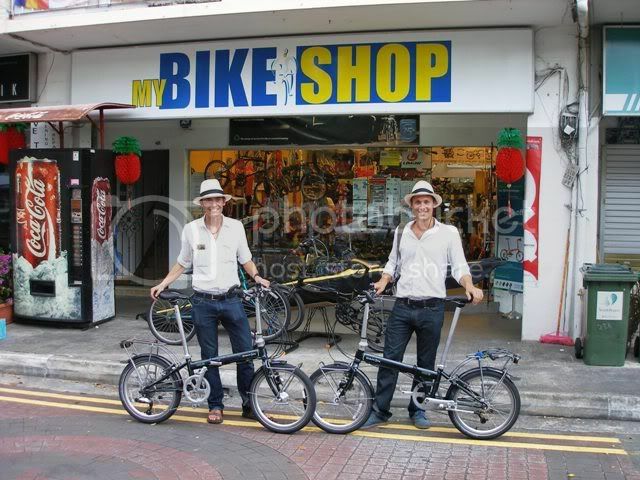 They only had connections with the Dahon office in Taiwan, and any order of parts would take at least a few months to arrive. Well, dear reader, AsiaWheeling did not have a few months. In fact our Thailand visas expired in less than 48 hours. We also had a date with a certain Mr. Stewart Motta in Laos for the Lao New Year. We needed to do a few things and fast. First of all, Scott explained to the bike owner that we had contacts in Singapore and would likely be able to get the parts ourselves. ProBike then agreed to store the wounded Speed TR and receive the parts. Scott immediately got on the phone with our friends at Speed Matrix and My Bike Shop in Singapore and discovered to our great relief that they did indeed have the parts we needed. Even with all this great fortune, we would need to wait until at least the middle of the next week for them to arrive in Bangkok. As long as we could solve the problem of our rapidly expiring Thai visas, the chances of them arriving in time for us to get up to Laos for the New Year with a working set of folding bicycles seemed pretty good. The next order of business was our legality in Thailand. We needed to do what the locals called a visa run. This entry was posted on Saturday, April 24th, 2010 at 10:58 pm and is filed under Scott, Thailand, Wheeling, Woody. You can follow any responses to this entry through the RSS 2.0 feed. You can leave a response, or trackback from your own site. The damage to Scott’s bike seemed more modest than I had imagined, and thank goodness for ProBike, SpeedMatrix and My Bike Shop. I look forward to seeing these rumored helmets? Agreed. The Speed TR is pretty rough and tumble. For a moment, I thought it might even still be ridable. But alas much of it was just too bent out of shape.